As mentioned yesterday, I’m still hesitant to get too excited about the Cleveland Browns’ front office overhaul. Despite the clout which comes from names like John Dorsey, Alonzo Highsmith and Eliot Wolf, I still wonder how successful they’ll be if owner Jimmy Haslam is still up to his interfering ways. This isn’t the only question I have when it comes to the newly revamped Browns front office. Along with wondering if the team’s owner will let his very experienced staff do its job without meddling, I’m also forced to ask the same question I had when Dorsey was initially acquired. If the Haslam was going to bring in such credible hires, why is he still forcing them to work with an inept coach? 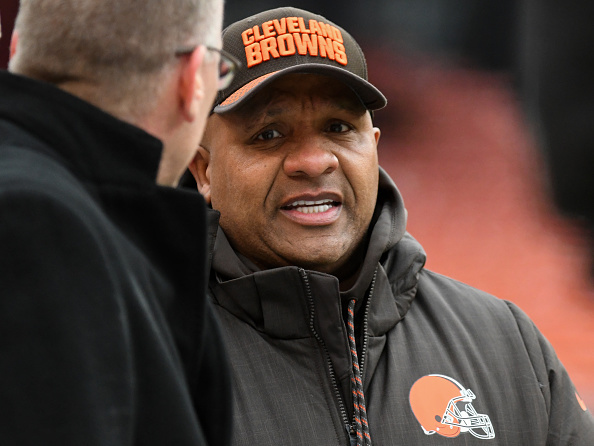 Hue Jackson, he of the 1-31 record with the Browns, is still here. Dorsey, Highsmith and Wolf were all told they had to work with him, that a new coach couldn’t be selected. Whatever kind of team this group assembles, Jackson is still the man in charge of running it on Sundays, despite the fact he just completed an 0-16 season. I personally can’t come up with a logical answer to this. To me, this is just more evidence the Browns made a mistake hanging on to their historically terrible coach. It’s worth noting we hardly needed more proof of this, especially after watching Jackson guide this team to an 0-16 season. Cleveland’s owner has been skewered ever since he gave his coach a vote of confidence at the end of the year, and rightly so. However, this is exacerbated when you realize the kind of talent Haslam just added to his front office. Dorsey, Highsmith and Wolf are all widely respected within the NFL, and each had other teams vying for their services. How they were convinced to join such a mess of an organization is beyond me, so Haslam does deserve some props for bringing them on board. That said, why is he forcing them to work with Jackson? Why did he give such credible hires free rein in team-building decisions, just as long as the incredibly unsuccessful coaching staff stays intact? The theory seems to be that, while Jackson is getting a third year, he’ll likely be on a short leash. Another rocky start to the 2018 season could result in the front office persuading Haslam to finally sever ties. If this is the case, then why even bother bringing Jackson back in the first place? If there’s a decent chance Cleveland’s coach will be fired by the middle of the season, what’s the point of even letting him start it? Jackson has given zero indication all he’s missing is talent. He’s been making head-scratching mistakes on a weekly basis for the better part of two years now, and has also been very quick to let us know the losing is everyone’s fault but his. So why saddle highly qualified front office members with a potentially temporary coach who might end up blaming them if he still can’t figure out how to win? Is Jackson really a better option than anyone these very respected men could’ve hand-selected? If those questions aren’t concerning enough, here’s an even bigger one. If the Browns do indeed stumble out of the gate in 2018, leading Jackson to proceed with his usual routine of blaming the front office, who’s Haslam going to side with? Cleveland’s coach spent much of 2017 laying all fault for the winless record at the feet of executive VP Sashi Brown. This ended up convincing Haslam he needed to be fired. If Jackson takes the same route in 2018, accusing a now-extremely qualified front office of being the source of struggles, will Haslam take the bait again? The hope is this won’t take place. You can’t bring in hires like Wolf, Highsmith and Dorsey if you’re still going to side with Jackson when things go awry. However, the fact we even have to consider such a scenario just highlights why retaining Jackson undercuts any optimism which comes from these new hires. The most logical outcome is their having to work with a lame-duck coach who may or may not try to throw them all under the bus the second things go off the rails. Tell me again why Jackson had to be retained?